What is Association for India's Development (AID)? AID is a non-profit, all-volunteer organization that partners with grassroots organizations in India. AID is dedicated to participating in equitable social, economic and environmental development in India. This includes support for projects in areas such as literacy, primary health care, education, women’s self help groups, vocational training, and struggles for justice and equity. The Bay Area chapter of AID was formed in August 1997. We are an enthusiastic group of working professionals, students and stay at home spouses who share the vision and aspiration of fellow AID volunteers. We share a willingness to make a difference – and learn – and unlearn - as we work together for the common good. We meet every 10 days and discuss our action plans for the days ahead. We evaluate projects, discuss current issues and affairs concerning development in India, and most importantly, determine how we can contribute. The activities of the chapter can be broadly classified into 5 categories: project reviews, advocacy campaigns, publicity, chapter administration and fund-raising activities. Volunteers choose to participate in one or more of these areas of work depending on their skills, interests and availability of time. We invite you to join us. We would appreciate any kind of support: it can be your valuable time; it can be monetary; or it can be just spreading the word about us. No special qualification is needed for a new volunteer to start participating with chapter activities. How cool are we ? 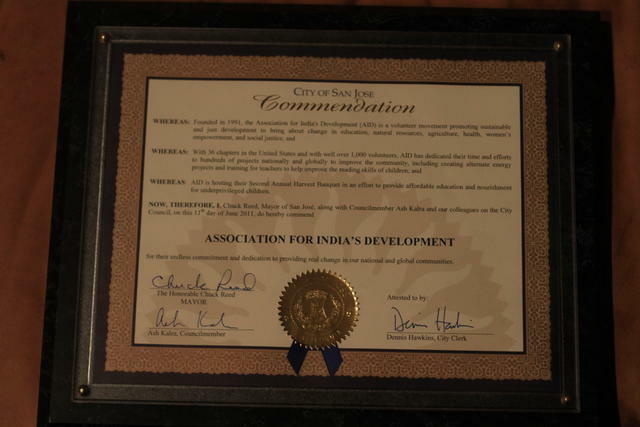 In June 2011, at AID's Annual Harvest Banquet in the Bay Area, San Jose Councilman Ash Kalra presented AID with a commendation seen below. You can work with AID in so many ways. Head on over to the Join Us page to learn more about joining or contributing to the Bay Area Chapter. Have more questions ? Reach out to us or just attend our next Community Service Hour and meet us in person. We love to meet new people !